Kola nuts, also known as Bissy Nuts, Guru Nuts and Cola Nuts, are the fruits of an African rainforest tree. The caffeine-containing nut smells a bit like rose petals, and has a taste that starts out bitter but eventually ends on a sweet note. Perhaps because kola nut has a long history of use in the preparation of beverages in African and Muslim cultures, John Pemberton, a 19th century American pharmacist, was inspired to combine kola with cocoa, sugar and carbonated water, giving the world the soft drink aptly named Coca-Cola. Cola acuminata belongs to the Malvaceae family. It is an evergreen tree that grows to about 20 meters in height. It has long, ovoid leaves which are pointed at both the ends with a leathery texture. 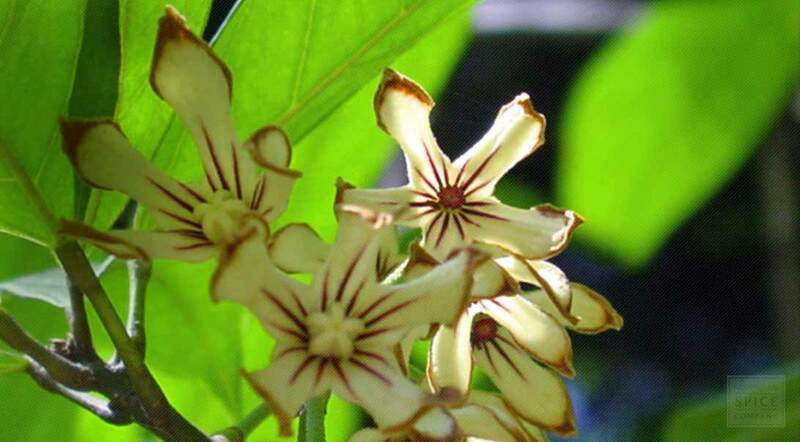 The trees bear yellow flowers with purple spots, and star-shaped fruit. Inside the fruit, about a dozen round or square seeds can be found in a white seed shell. The kola nut’s aroma is sweet and rose-like. The first taste is bitter, but it sweetens upon chewing. The genus name Cola is a Latinized form of a West African name of the tree (Temne: kola, Mandingo: kolo). Cola acuminata grows in the forests of the Democratic Republic of Congo in Africa, the Sierra Leone and North Ashanti near the sources of the Nile, also cultivated in tropical Western Africa, West Indies, Brazil, and Java. Kola nut trees are usually found growing near the sea-coast or in tropical rainforest conditions. The trees need a hot humid climate, however they can withstand a dry season on sites with a high ground water level. Kola nut trees may be cultivated in drier areas where ground water is available. Kola nut trees prefer a deep, rich, fertile soil. 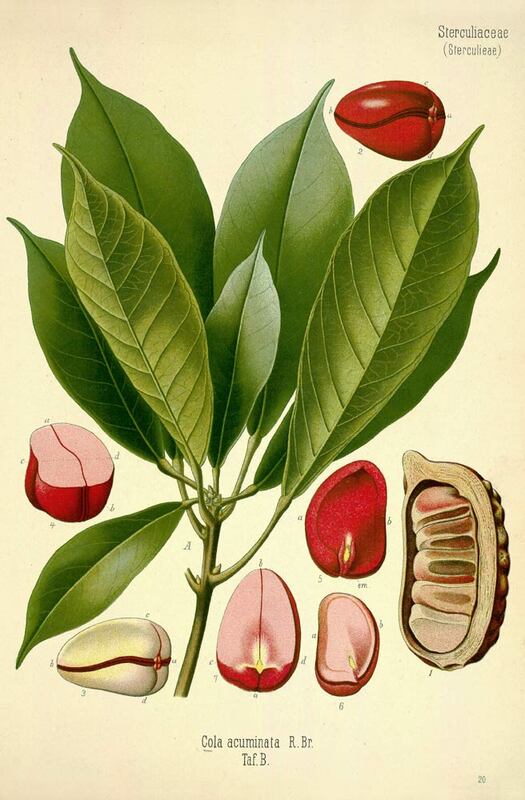 Kola nut trees are usually grown from seed, although cuttings are sometimes used. Trees will bear in 7-10 years from seeding. Sow seeds in a greenhouse in rich soil. When seedlings are large enough to handle, transplant them to individual containers. Kola nuts can be harvested mechanically or by hand, by plucking them at the tree branch. They are dried and may be ground into powder for later use. Store dried kola nut powder in an airtight container in a cool, dry place.